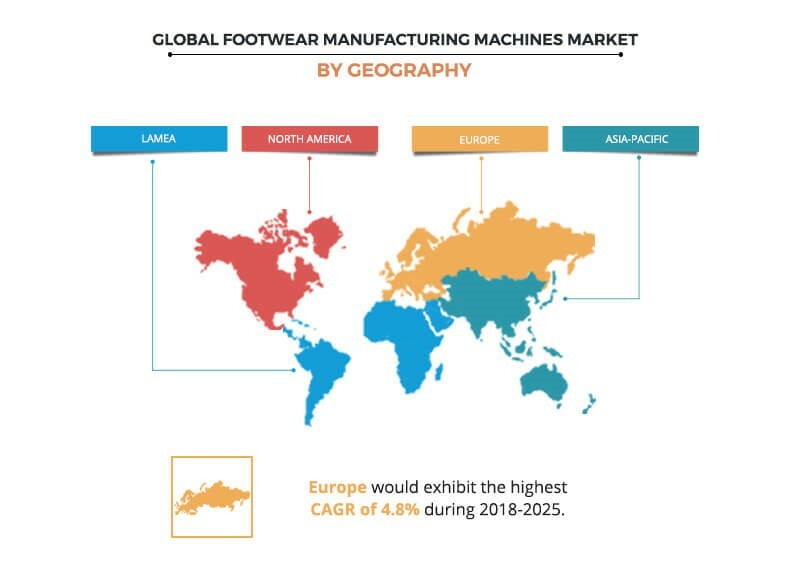 The global footwear manufacturing machinery market is expected to reach $23,372.1 million by 2025, from $16,836.3 million in 2017, growing at a CAGR of 4.3% from 2018 to 2025. Footwear manufacturing machinery includes machinery used to manufacture different parts of footwear such as sole, insole, and others. These machines also assemble and stabilize the footwear components to produce a finished footwear product. With the help of these machineries, manufacturers can give different shape, size, design, and pattern to footwear product. The footwear manufacturing machinery includes a range of machines used for cutting machines, pattern making, sewing machines, lasting machines, closing machines, bottoming machines, finishing machines, insole making machines, shoe repair machines, and others. Companies such as Atom S.p.A, Brustia Alfameccanica S.r.l., Comec, Comelz S.p.A, and other leading players have a major share in the footwear manufacturing machines market. The rapid change in lifestyle and change in fashion trend boost the demand for footwear with different shapes and designs. Thus, footwear manufacturers are installing footwear making machines to simplify the manufacturing process and improve product quality. This in turn, boost the demand for footwear manufacturing machinery in the market. Moreover, improved economic growth and increase in disposable income boost investment in consumption of footwear and thus, footwear manufacturing machines. Further, many footwear manufactures are investing in footwear making machines featured with advance technologies to improve manufacturing process. This is ultimately expanding the footwear manufacturing machines market. Also, these advances in the footwear manufacturing machinery increase the production capacity and reduce operational time. These factors are expected to fuel the demand for footwear manufacturing machines during the forecast period. However, high initial investment associated with setup of footwear manufacturing machinery and uncertainty in the manufacturing sector are expected to hinder the market growth. Nonetheless, increase in emphasis on domestic manufacturing is expected to provide lucrative opportunity for small players in the developing countries. The global footwear manufacturing machinery market is segmented by solution, machine type, and region. The solutions segment includes various products and services related to footwear manufacturing machinery. In 2017, the product segment dominated the market, in terms of revenue, and is expected to maintain this trend in the coming years. The product segment is further divided into cutting machine, lasting machine, shoe stitching machine, closing machines (upper assembly), bottoming machines, finishing machines, and others (insole making machine, managing & handling machine, and shoe repair machine). The service division is sub segmented into maintenance and repair services. Based on machine type, the market is categorized into manual machine, semi-automatic machine, and automatic machine. 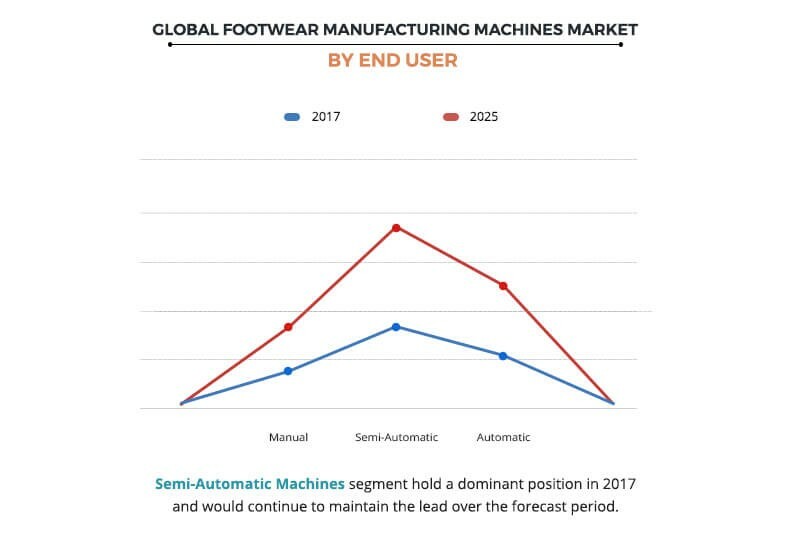 The semi-automatic machines segment is anticipated to dominate the global footwear manufacturing machines market throughout the forecast period. Based on region, the market is analyzed across North America, Europe, Asia-Pacific, and LAMEA. In 2017, Asia-Pacific accounted for the highest share in the footwear manufacturing machinery market and is anticipated to secure the leading position during the forecast period, owing to wide presence of footwear manufacturing companies and key presence of footwear making machinery manufacturers in Taiwan. Competitive analysis and profiles of the major footwear manufacturing machines market players, such as ALC Tecnologie Adesive S.r.l., Atom S.p.A, Brustia Alfameccanica S.r.l., Comec, Comelz S.p.A, Dongguan Kingstone Shoe-making Machinery Co. Ltd., Elitron IPM S.r.l., Kou Yi Iron Works Co., Ltd., Orisol Taiwan Ltd., and True Ten Industrial Co., Ltd. are provided in this report. 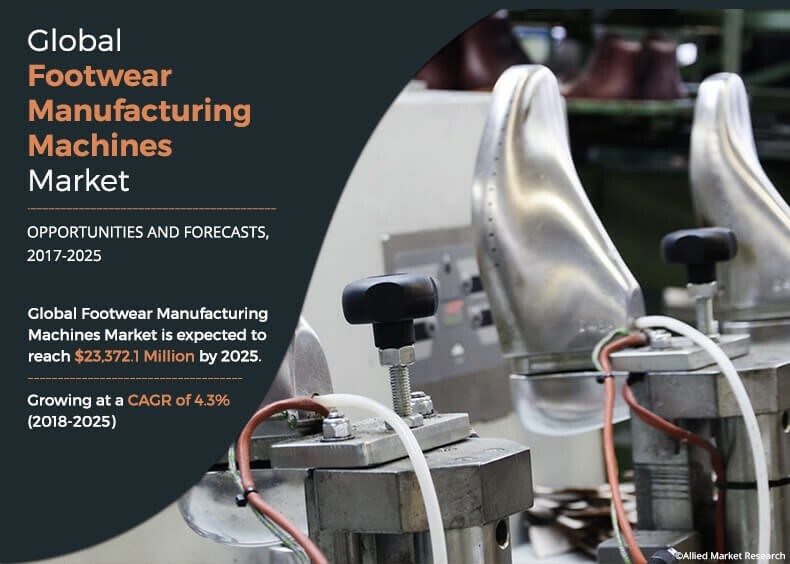 The report provides an extensive analysis of the current and emerging market trends, and dynamics in the global footwear manufacturing machines market. Key market players within the footwear manufacturing machines market are profiled in this report and their strategies are analyzed thoroughly, which help in understanding the competitive outlook of the global footwear manufacturing machines market. 7.1. ALC Tecnologie Adesive S.r.l. 7.6. Dongguan Kingstone Shoe-making Machinery Co. Ltd. The global footwear manufacturing machines market signifies a noteworthy growth due to the increase in deployments in the emerging countries such as India, China, and others. Further, adoption of footwear making machines is on the rise owing to increased production of trendy footwear to customers changing demand according to fashion trends. Furthermore, reduced labor cost, operational time, increased productivity, and high precision of work are other major factors that fuel the demand for footwear machines in market. However, uncertainty in the manufacturing industry can hinder the market growth to a certain extent. Footwear manufacturing machines have wide demand in Asia-Pacific, followed by LAMEA, Europe, and North America. The highest share of the Asia-Pacific market is attributable to wide presence of footwear manufacturing companies and key presence of footwear making machinery manufacturers in Taiwan. Moreover, semi-automatic machines have wide demand in market, as these machines are developed using automation. However, they still need human intervention to simplify the process. These machines can complete work with high precision and changes of product damage are low as compared to other machine types. 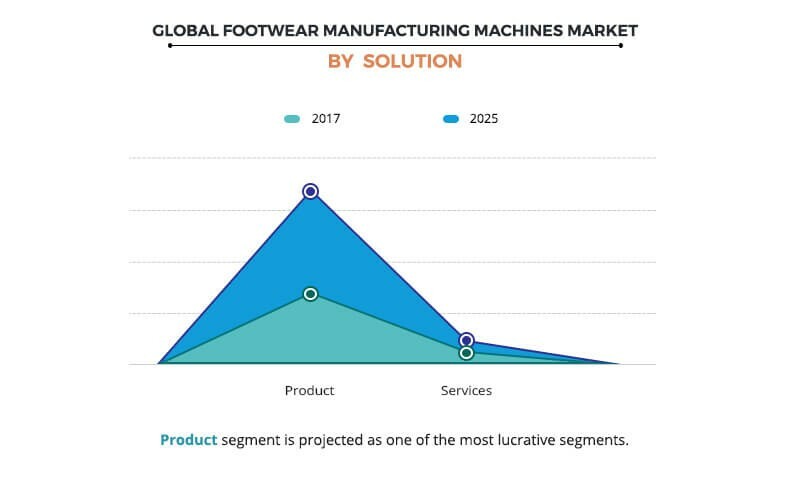 In addition, various leading manufacturers such as Atom S.p.A, Brustia Alfameccanica S.r.l., Comec, and Comelz S.p.A occupy a prominent revenue-share in the footwear manufacturing machines market.